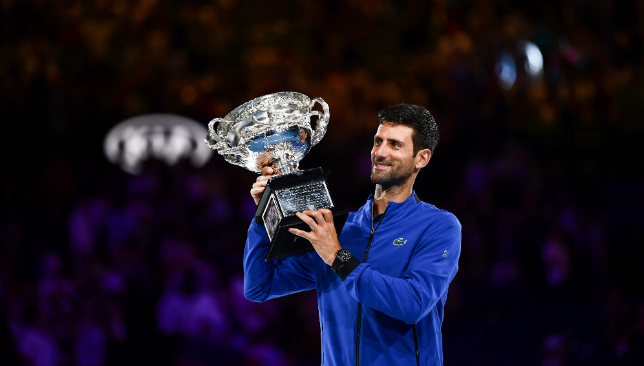 Novak Djokovic said on Monday he is targeting a Roland Garros win next spring to hold all four Grand Slam titles for the second time in his career and inch closer to Roger Federer’s record 20 Grand Slam tournaments. The world no. 1 was speaking at Melbourne’s Botanical Gardens less than 24 hours after conquering a record seventh Australian Open trophy with a dominant performance against Rafael Nadal in the final. “I don’t want this to sound arrogant but I’ve done it once, why not do it again?’,” said the Serbian. The 15-time Grand Slam champion broke his tie with Roger Federer and Roy Emerson for most Australian Open men’s titles. He also broke a tie with his idol, Pete Sampras, for third-most Grand Slam trophies; Djokovic now only trails Federer with 20, and Nadal with 17. Djokovic has only won the French Open once before, in 2016, when he held all four Grand Slams at the same time. Novak Djokovic won his 15th Grand Slam and a record-breaking 8th Australian Open. The predictions had been for something akin to their near six-hour battle in the final here seven years ago but Djokovic had other ideas, taking just two hours and four minutes to claim a 6-3, 6-2, 6-3 victory and a 15th slam crown.